Welcome to another edition of Mini Albums to Go where we bring you up to speed with what's going on at Scrapbook-Crazy.com. We have lots of new mini album tutorials for you to try out, a couple of giveaways and a brand new contest that anyone can enter. Badge holder mini album. Be sure to see this newsletters freebie mothers day printable mini book. Recycled scrapbooking at its peak! How cool are these mini toilet roll scrapbooks. Great for beginners and experts alike. Love the minis that are a keepsake and display item all in one? Then you will have fun making this mini album. Amy Mahart shares her tutorial to make this tri-fold cardstock mini scrapbook. Use those old school retro vinyl records to make fantastic round mini albums. We'd love to feature your own Mini album tutorial email us at info@scrapbook-crazy.com to submit yours. Do you have Momitude? Celebrate your Motherhood this Mother's Day with an adorable digital kit from designer Miss Mint at Peppermint Creative.com. Filled with feminine colors and fabulous elements, this kit is perfect for all your special pages, projects and gifts and it's yours FREE for a limited time! 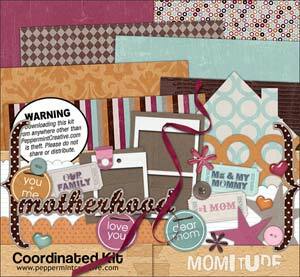 Use coupon code: MOM09KIT at checkout to download for free. layered templates, hybrid projects, calendars, digital die-cutting files for your Silhouette, Wishblade & Cricut. Visit our FREE page for our current complimentary download. Follow Peppermint Creative on Facebook or Twitter. She who recycles best wins! We have a little competition which is all about upcycling your toilet tissue rolls. Make something fabulous with them for your chance to win a scrapbook voucher prize from the online scrapbook store of your choice. We have made an exclusive Mothers Day album for our newsletter subscribers. to print off and make. Simply cut out each of the pages, attach your cropped photo and slip them into a badge holder. You can make this mini mom album any time you like. It's not just for mothers day. 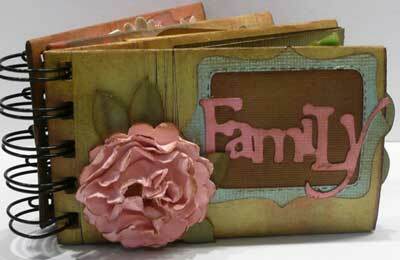 Keeping with the toilet paper roll theme, this months featured readers mini is this Family mini book by Leanne. Check out all the pretty pages. Feel free to forward this newsletter to a friend or egroup. If this newsletter was referred to you by a friend then make sure you subscribe to mini albums to go to ensure you are the first to know about our freebies, competitions and updates. © 2007-2008 www.Scrapbook.Crazy.com. All rights reserved.